Can-Am gives recreational-sport and performance-driving enthusiasts more ways to discover their adventurous side in 2019, offering three new Maverick Sport family vehicles and fulfilling its promise to unveil a new side-by-side vehicle every six months through the year 2020. The first is a 60-in. (152.4 cm) Maverick Sport MAX DPS 1000R side-by-side vehicle capable of comfortably carrying four adults. The other two new additions to the Maverick Sport family are each 64-in. (162.6 cm) wide, two-seat specialty Maverick Sport X-package vehicles. The Maverick Sport X rc 1000R and the Maverick Sport X mr 1000R designed for trails and specific riding conditions, namely rocks and mud, respectively. All three vehicles are meant to compliment the rest of the Maverick Sport vehicles, introduced in April 2018, and to expand the brand’s growth in the popular recreational-sport segment (namely the 60-in. realm). All three side-by-side vehicles are versatile enough for single-driver exploits, but are best enjoyed in their specific area of expertise, whether it’s multi-passenger trail excursions in the desert or two-rider getaways in the mud or rocks. Each unit is cleverly designed with the enthusiast user in mind, complete with hearty Rotax power, exceptional handling and perfected suspension calibration. A superior fit and finish, inside and out, unmatched interior comfort and a signature look give these vehicles an edge in the field and against the competition. Hallmark Can-Am DNA and Maverick X3 family styling make them instantly as recognizable as they are functional, completing the overall packages. The Can-Am Maverick Sport MAX DPS 1000R delivers multi-passenger excitement in a daring, precise and confident package. The versatile performance side-by-side vehicle is perfectly tuned for trails with its spot-on power, handling and suspension calibration. A performance-grade suspension system with FOX 2.0 PODIUM Piggyback shocks with QS3 adjustment, power steering, and 60-in. (152.4 cm) width offer predictable control and sharpened handling. A strong, rear-mounted Rotax V-Twin engine supplies optimal performance and reduces cockpit noise. Meaningful designs and functions include an advanced Ergo-lok cockpit and longer wheelbase for superior comfort and roominess for four riders. To enrich the interior comfort, four ERGOPRINT seats, additional foot rests and passenger grab bars complement the driver’s standard amenities. Its wide, premium half doors, signature grill and LED lighting boldly display its Maverick X3 vehicle heritage while also adding to its polished fit-and-finish. More than 200 accessories are available at launch to let owners customize the vehicle to fit their needs. The Maverick Sport MAX DPS 1000R has a starting price of $18,999 US. The Maverick Sport MAX DPS 1000R is equipped with a talented 100hp 976cc Rotax V-Twin engine. To gain more performance, the 1000R package wears a unique exhaust line and muffler for enhanced airflow, wears an additional CVT air intake and also sports the driven pulley from the Maverick X3, which gives it an additional 11 ft-lb. of torque and 25 extra horsepower. The engine, optimized for sporty trail and desert situations, is placed in the rear of the chassis to produce a quiet, cool ride for the occupants. Along with reduced vibration, standard engine braking improves control on the trail. Located on the right side of the vehicle behind the passenger seat near the cargo bed, the air intake supplies the engines with clean, fresh air for optimal performance. A large radiator keeps the Maverick Sport MAX side-by-side vehicles running at optimal temperatures even in the most challenging terrain. The Maverick Sport MAX DPS 1000R uses the same larger airbox from the Maverick X3 vehicle. The airbox ensures the Rotax engine is continuously receiving optimal amounts of cool, clean air. We paired the sturdy engine with a stout transmission to ensure unmatched dependability and toughness when the Maverick Sport MAX vehicle tackles challenging terrain. The CVT with QRS is designed to provide smooth, precise power delivery as well as predictable deceleration. The CVT, with its additional CVT intake to draw more air to the clutch, was outfitted with appropriate ratios to deliver optimal torque for the Maverick Sport MAX and include gear selections for P / R / N / H / L. The system includes integrated electronic belt protection for reassurance out in the sticks. The gear-on-gear rear differential means increased responsiveness and less required maintenance. The helical gear transmission, combined with the CVT rearward location, ensures a quieter environment for the occupants. The Maverick Sport MAX DPS 1000R includes the single-mode Dynamic Power Steering (DPS) system that is tuned for both low- and higher-speed trail riding. The Visco-Lok Quick Engagement (QE) calibration supplies an even quicker engagement of the front differential, which can lock up to 100 percent with no rev or speed limiter. The Maverick Sport MAX vehicle’s seating has been enhanced with colored accents for a refined look. The four ERGOPRINT bucket seats feature a sports car-like design for optimal support and weight distribution. The Maverick Sport MAX side-by-side vehicle’s front seats can be adjusted to fit the operator’s needs. The seats adjust both 5-in. / 12.7 cm (front and rear) to adapt to drivers of all sizes. The driver and passenger seats feature removable seat cushions and backrests to simplify cleaning after long off-road adventures. When removed, the passenger seat also features 2 LinQ quick-attach locations for added convenience and versatility. To dial in the fit, drivers are afforded up to 25 degrees of steering adjustment from the tilt steering wheel to go along with the adjustable driver’s seat. The vehicle’s gauge is even fixed on the steering column to maintain excellent visibility even when the steering wheel is adjusted. The multifunction digital gauge supplies the driver with instantaneous feedback during the ride (speedometer, odometer, trip and hour meters, fuel, gear indicator, seat belt, diagnostic and clock). The front and rear passenger spaces include ample elbow room and ergonomically designed grab bars to supply all the passengers with a comfortable fit. Optimally positioned footrests for all passengers, and even one angled footrest on the driver’s side, enhance the interior comfort of the Maverick Sport MAX vehicle. The Maverick Sport MAX is designed to lead the segment in leg room, shoulder space and overall comfort, has a spacious cockpit to accommodate adult drivers of many heights and sizes. The Maverick Sport MAX vehicles also offer 2-in. / 5.1 cm more front leg room than their closest competitor. The chassis incorporates automotive standards, which means less vibration, additional comfort and advanced air flow to the occupants. An integrated front heat deflector ensures the cockpit remains cool. The Can-Am Maverick Sport MAX is outfitted in standard form with 6.5-Gal. of onboard storage for added convenience, comfort and functionality. This includes a glove box and two additional areas on the vehicle’s dash. The multi-function cargo box includes 8 LinQ quick-attach locations, four anchor hooks and integrated drain holes for added convenience and versatility. The Maverick Sport MAX can tow up to 1,500-lbs. and has a 2-in. receiver hitch as standard equipment. A dash-mounted lighter type DC outlet comes standard. The Maverick Sport vehicles have a large, class-leading 10-Gal. (38L) fuel tank. Like all Can-Am side-by-side vehicles, the new Maverick Sport MAX has a superior fit and finish, inside and out, to outrun the competition and satisfy owners from around the globe. Our design team deliberately blended the Maverick X3 heritage with that of the Maverick Trail family to create the Maverick Sport and Maverick Sport MAX vehicles. This means key family design elements include hood shape, headlight angles, grille scheme and eye-catching lines are inspired by the Can-Am Maverick X3 vehicle DNA. Two powerful 55-W reflectors light up even the darkest of trails. Two, high-grade LED taillights are added as a safety measure for trailing vehicles. The Maverick Sport MAX includes the highly recognizable signature LED front running lights giving them added charisma. To date, roughly 200 some accessories will fit the Maverick Sport family vehicles. An integrated PAC-ready wiring harness is mated to the onboard 650-W magneto. The Maverick Sport MAX comes standard with 3-point seat belts. However, for both occupant security and comfort, we installed the 4-point harness brackets on the Maverick Sport MAX at the Can-Am factory. The maintenance-free, throttle-by-wire system (iTC) teams with a large volume throttle body to produce smooth throttle delivery even if the driver’s foot is bouncing due to the terrain. The Maverick Sport DPS side-by-side vehicles have a selectable Sport mode, which offers a fast throttle response for quicker trail driving, and ECO mode for a smoother ride with a more filtered power delivery. Ventilated dual 220 mm disc brakes with hydraulic twin-piston calipers, front and rear. Durable. 27-in. Maxxis Bighorn 2.0 tires offer versatile traction, a smooth ride and great shock absorption for trail use. Painted 12-in. aluminum wheels come standard on the Maverick Sport MAX DPS 1000R vehicle. With a 120.6-in. wheelbase and versatile 60-in. width (152.4 cm), the Maverick Sport vehicles are stable. The engineering team determined front-to-rear vehicle weight distribution is optimal at 42% / 58%. This setup, factoring in the rear- mounted engine and occupants at the center of the chassis, produced a driving package that can supply comfort, stability and control. A very favorable 12-in. (30.5 cm) of ground clearance comes standard with the Maverick Sport MAX vehicle. The front double A-arm suspension with FOX 2.0 PODIUM Piggyback with QS3 compression adjustment gas-charged shocks virtually eliminates bump steer and camber changes while supplying an ample 12.5-in. (31.8 cm) of suspension travel. The Torsional Trailing A-arm (TTA) rear suspension provides 13-in. (33 cm) of suspension travel and wears FOX 2.0 PODIUM Piggyback with QS3 compression adjustment gas-charged shocks to deliver outstanding trail comfort. The Can-Am Maverick Sport side-by-side vehicles use an advanced lightweight Dual-Phase 980 steel and high-strength low alloy (HSLA) steel for enhanced strength and added torsional stiffness. The 1.85-in. (4.7 cm) tubular cage is fully ROHVA compliant and creates a protective barrier around both driver and passenger. All Maverick Sport side-by-side vehicles include integrated mudguards for added form and functionality. A stylish front bumper provides added protection for the front end. A full skid plate protects the underside of the vehicle while also allowing it to slide over certain mid-trail obstacles. Premium half doors create a more complete cockpit. The doors also have an outer handle for opening and an interior grab handle for use when riding. For the first 1,800 miles (3,000 km) the Maverick Sport MAX side-by-side vehicles are designed to be maintenance free and no break-in maintenance is required. We built the Maverick Sport MAX vehicles with DIY friendly maintenance. A durable painted Can-Am Red color is standard with the Maverick Sport MAX DPS 1000R package. The new Maverick Sport X rc side-by-side vehicle ($21,299 US) comes factory-equipped for trails and rock-crawling with a 64-in. (162.5 cm) stance, higher clearance and added interior and exterior protection for operation in harsh environments. The inclusion of Smart-Lok with ROCK and TRAIL modes, high-grade FOX 2.5 PODIUM QS3 shocks, arched A-arms, larger Maxxis tires and Dynamic Power Steering provide exceptional maneuverability when the going gets rough. Additional items include premium half doors, winch with synthetic rope and a unique coloration and graphics package to complete the look. The Maverick Sport X rc is equipped with a talented 100 hp 976cc Rotax V-Twin engine. The 1000R engine, optimized for sporty trail and desert situations, is placed in the rear of the chassis to produce a quiet, cool ride for the occupants. Along with reduced vibration, each power plant includes engine braking for enhanced control on the trail. The Maverick Sport X rc include the single-mode Dynamic Power Steering (DPS) system that is tuned for both low- and higher-speed trail riding. The electronically controlled front lockable differential system with Smart-Lok technology ensures maximum traction and enhanced slow-speed maneuverability especially in challenging terrain. The Smart-Lok system, developed in conjunction with TEAM Industries, takes integrated intelligence to new heights and allows on-the-fly adjustments. The differential can lock and unlock on the fly no matter the speed, letting the driver focus on the trail. The electronic system, via its Front Differential Module (FDM), gathers at least six data inputs (engine torque, vehicle speed, wheel RPM, steering feedbacks, throttle pedal, gear position) and smartly, strongly and quickly engages an integrated actuator with proper load and without delay. The result is simple steering output (same as being fully open), allowing the driver to accurately conquer varying obstacles while maintaining momentum. The driver has the option to select between four modes: 2x4 / 4x4 fully locked / 4x4 ROCK and 4x4 TRAIL. The pre-set ROCK and TRAIL settings are designed to enhance the off-road experience by offering a more customized feel to match to specific terrain, conditions and demands. The maintenance-free, throttle-by-wire system (iTC) teams with a large volume throttle body to produce smooth throttle delivery even if the driver’s foot is bouncing due to the terrain. The Maverick Sport X rc have a selectable Sport mode, which offers a fast throttle response for quicker trail driving, and ECO mode for a smoother ride with a more filtered power delivery. The system also includes and Electronic Hill Descent Control for improve performance. Located behind the seats above bed, the oversized air intakes supply the engine and CVT with clean, fresh air for optimal performance. A large radiator keeps the Maverick Sport X rc running at optimal temperatures even in the most challenging terrain. The Maverick Sport X rc is outfitted with a larger Donaldson airbox (from the Maverick X3) to ensure the Rotax engines are continuously receiving optimal amounts of cool, clean air. A high-performance QRS CVT transmission includes Electronic Drive Belt Protection to alert the driver when the vehicle should be in low range. We paired the sturdy engines with a stout transmission to ensure unmatched dependability and toughness when the Maverick Sport X rc takes to challenging terrain. The CVT with QRS is designed to provide smooth, precise power delivery as well as predictable deceleration. The CVT was outfitted with appropriate ratios to deliver optimal torque for the Maverick Sport X rc and includes gear selections for P / R / N / H / L. The system includes integrated electronic belt protection for reassurance out in the sticks. The gear-on-gear rear differential means increased responsiveness and less required maintenance. The helical gear transmission, combined with the CVT’s rearward location, ensures a quieter environment for the occupants. 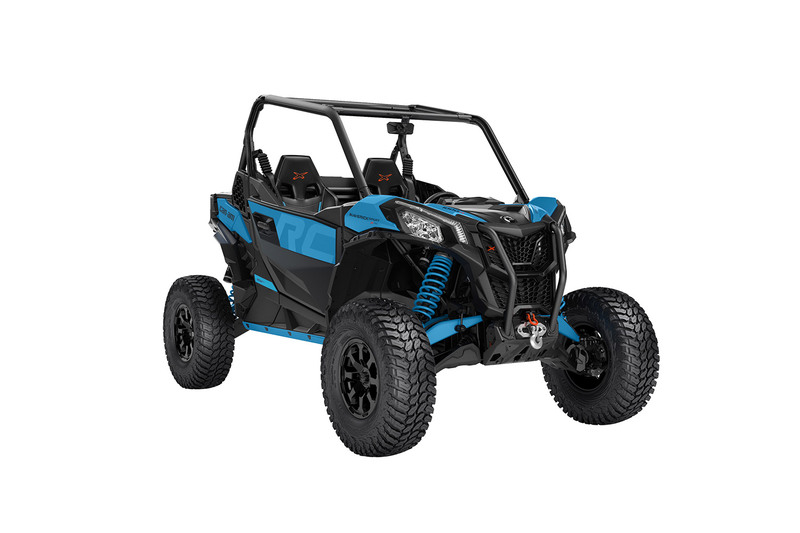 Influenced by the Maverick X3 X rc package, the appropriately outfitted and new Maverick Sport X rc wears the family’s “rc” graphics, an ominous color scheme and specific components to boldly state it, too, is ready to for rock crawling. The Maverick Sport X rc vehicle has a 15-in. (38.1 cm) ground clearance to accommodate varying conditions, but more so to shine in the rocks, where high clearance is mandatory. Its raised stance and off-road posture ensures top-notch performance without limit range of sight. The Maverick Sport X rc vehicle’s ErgoPrint seating has been enhanced with X-Team colored accents for a refined look. The seats feature a sports car-like design for optimal support and weight distribution. The Maverick Sport X rc includes standard 3-point seat belts and is also ready to accept 4- and 5-point harness systems. With more than 200 total Can-Am and partnership accessories available for the Maverick Sport family of side-by-side vehicles, owners can customize their vehicle–even when already pre-built for rock-crawling—to whatever level they desire. Available items include bumpers, graphics, racks and roofs. Installation is designed to be quick and easy, especially when using Can-Am LinQ accessories. The Maverick Sport X rc 1000R includes an arched double A-arm front suspension package, with 14.75-in. (37.5 cm) of suspension travel. Premium FOX 2.5 PODIUM Piggyback with QS3 compression adjustable shocks improve the handling and performance in difficult terrain. The arched Torsional Trailing A-arm (TTA) rear suspension, complete with a sway bar, provides 14.75-in. (37.5 cm) of suspension travel and wears FOX 2.5 PODIUM Piggyback with QS3 compression adjustment shocks to deliver outstanding comfort on the trail. The Can-Am Maverick Sport X rc 1000R offer increased protection for both occupants. Like the other Maverick vehicles in the family the X rc package includes the unique-and-unyielding cage, integrated front bumper, a front tow hook and full skid plate. However, because of their rock-crawling focus, each Can-Am vehicle also wears, HMW rock sliders, HMW front and rear suspension protectors and an HMW front differential guard for enhanced defense against harsh terrain and rocks. Protection includes a stout black cage, premium half doors and capable 3-point seat belts. Premium looking 14-in. (35.6 cm) aluminum wheels with large 30-in. (76.2 cm) Maxxis Liberty tires supply numerous biting edges, sturdy lugs and confidence for negotiating both trails and rocky challenges alike. A necessity for traversing a challenging rock-strewn trail or competitive course, the Maverick Sport X rc package includes a 4,500-lbs. winch with a synthetic rope and rock guard sleeve. The durable system, mounted low on the front bumper of the vehicle, offers ample pulling strength when traction and leverage are in utmost demand. The synthetic rope is ideal because it’s both strong and lightweight and is easy to work with in high-use situations. The 100hp Maverick Sport X rc 1000R comes in Carbon Black and Octane Blue, but also includes a black cage. The new Maverick Sport X mr ($20,999 US) side-by-side vehicle targets mud-riding enthusiasts with an amplified appearance and purpose-built refinements, including snorkeled air and engine intakes. Like the Maverick X3 X mr in the Can-Am family, this two-seat mud beast is specifically built from the factory with a mud-ready design that turns heads for both its impressive performance and head-turning appearance. The Maverick Sport X mr includes a strategically positioned engine air intake and CVT air intakes / exhaust, Smart-Lok with MUD and TRAIL modes, higher travel, arched A-arms, a stable 64-in. (162.6 cm) width, extended ground clearance and aggressive ITP mud tires for superior traction. Dressed in the X mr family’s Carbon Black and Sunburst Yellow color and graphics, the Maverick Sport X mr includes a new gauge, FOX 2.5 PODIUM QS3 shocks and premium half doors for a more functional performance and better fit-and-finish. The Maverick Sport X mr is equipped with a talented 100hp 976cc Rotax V-Twin engine. The engine, optimized for sporty trail and desert situations, is placed in the rear of the chassis to produce a quiet, cool ride for the occupants. Along with reduced vibration, each power plant includes engine braking for enhanced control on the trail. A high-performance QRS CVT transmission with lower gearing ratio includes Electronic Drive Belt Protection to alert the driver when the vehicle should be in low range. We paired the sturdy engines with a stout transmission to ensure unmatched dependability and toughness when the Maverick Sport vehicles take to challenging terrain. The CVT with QRS is designed to provide smooth, precise power delivery as well as predictable deceleration. The CVT was outfitted with appropriate ratios to deliver optimal torque for the Maverick Sport X mr and includes gear selections for P / R / N / H / L. The system includes integrated electronic belt protection for reassurance out in the sticks. The gear-on-gear rear differential means increased responsiveness and less required maintenance. The helical gear transmission, combined with the CVT’s rearward location, ensures a quieter environment for the occupants. The Maverick Sport X mr includes the single-mode Dynamic Power Steering (DPS) system that is tuned for both low- and higher-speed trail riding. The electronically controlled front lockable differential system with Smart-Lok technology ensures maximum traction and enhanced slow-speed maneuverability especially in challenging terrain. The Smart-Lok system, developed in conjunction with TEAM Industries, takes integrated intelligence to new heights and allows on-the-fly adjustments. The differential can lock and unlock on the fly no matter the speed, letting the driver focus on the trail. Smart-Lok offers intelligent modes for different riding conditions. The brain controlling this industry leading technology is the Front Differential Module, gathering input from six key vehicle parameters. It analyzes front wheel speed from both sides, steering angle, accelerator pedal, gear position, engine torque and vehicle speed. Depending on the readings and the Smart-Lok setting, the actuator will instantaneously initiate the locking of the front differential. The result is simple steering output (same as being fully open), allowing the driver to accurately conquer varying obstacles while maintaining momentum. The driver has the option to select between four modes: 2x4 / 4x4 fully locked / 4x4 MUD and 4x4 TRAIL. The pre-set MUD and TRAIL settings were strategically calibrated to supply a more customized feel to match to specific terrain, conditions and demands. The maintenance-free, throttle-by-wire system (iTC) teams with a large volume throttle body to produce smooth throttle delivery even if the driver’s foot is bouncing due to the terrain. The Maverick Sport X rc has a selectable Sport mode, which offers a fast throttle response for quicker trail driving, and ECO mode for a smoother ride with a more filtered power delivery. The system also includes and Electronic Hill Descent Control for improve performance. There are four critical total components located high in the vehicle behind the driver’s seat that flow air for enhanced cooling and protection from the elements. Two of these serve as CVT air intakes, while a third is an engine intake that supplies the Rotax with optimal air supply. Another snorkel is designated for expelling the CVT exhaust. The X mr family features a unique graphics package with a captivating color scheme, as well as all the necessary mud attire, giving it a disruptive identity with a thirst for mud. The Maverick Sport X mr vehicle has exceptional ground clearance at 15-in. (38.1 cm) to accommodate varying conditions, but especially the unpredictability of mud. Its heightened stance creates optimal off-road capabilities without compromise to the occupants’ line-of-sight. The Maverick Sport X mr vehicle’s ErgoPrint seating has been enhanced with X-Team colored accents for a refined look. The seats feature a sports car-like design for optimal support and weight distribution. The Maverick Sport X mr includes standard 3-point seat belts and is also ready to accept 4- and 5-point harness systems. With more than 200 total Can-Am and partnership accessories available for the Maverick Sport family of side-by-side vehicles, owners can customize their vehicle–even when already pre-built for mud riding—to whatever level they desire. Available items include bumpers, graphics, racks and roofs. Installation is designed to be quick and easy, especially when using Can-Am LinQ accessories. The Maverick Sport X mr 1000R includes an arched double A-arm front suspension package, with 14.75-in. (37.5 cm) of suspension travel, and FOX 2.5 PODIUM Piggyback with QS3 shocks to enhance clearance in difficult terrain. The Torsional Trailing A-arm (TTA) rear suspension, complete with a sway bar, provides 14.75-in. (37.5 cm) of suspension travel and wears FOX 2.5 PODIUM Piggyback with QS3 compression adjustment shocks to deliver outstanding comfort on the trail and in the muck. The Can-Am Sport X mr offers increased protection for all occupants. This X mr package includes the unique-and-unyielding cage, a front tow hook, integrated front bumper and full heavy-duty HMW (high-molecular weight) polyethylene skid plate. The Maverick Sport X mr vehicle comes standard with a black cage and premium half doors. The Can-Am Maverick Sport X mr side-by-side vehicle wears 14-in. (35.6 cm) cast-aluminum wheels. ITP Cryptid tires, 30-in. (76.2 cm), are purpose built to perform in muddy terrain with a tread pattern designed to deliver unparalleled forward traction with a graduated lug height (up to 2-in. / 5.1 cm) inches at the tire's shoulder. The resulting “paddle-like” shoulder design provides maximum side bite for climbing in and out of the mud without compromising ride comfort on trails and hard pack. The grooved center lugs also channel away mud and create unmatched predictability in ruts. The Maverick Sport X mr package includes a 4,500-lbs. winch with a synthetic rope as mandatory equipment. The durable system, mounted near the front bumper of the vehicle, offers ample pulling strength. The synthetic rope is ideal because it’s both strong, lightweight, easy to clean and perfect in high-use situations. The 100hp Maverick Sport X mr vehicle wears the X mr family’s Carbon Black and Sunburst Yellow finish. It also features a matching bumper, hood, A-arms, and trailing arms.